The trails database showcases the extensive trail network in and around Whistler. The interactive map is intended to provide an overview of trails, their locations and degree of difficulty. Users may click on individual trails to access more detailed information. Trail Forks uses a trail rating system that aligns with the International Mountain Bicycling Association guidelines. In general, Whistler's trails are considered more difficult than other trail network areas due to their technical nature. Please use your best judgement when riding and err on the side of caution if you are unfamiliar with the terrain. Data for the trail maps is provided by Trailforks.com, a crowd-sourced mountain bike trail database and management system for riders, builders and trail associations owned by Pinkbike. 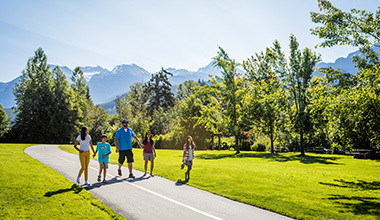 The maps, elevations, and distances are intended to provide a general overview of Whistler’s trails. Tourism Whistler does not maintain the trail database and is not responsible for any errors or omissions. Here's the top tips on things to do with your mountain bike around Whistler, with something for every level rider. Biking starts when the snow melts and continues until it covers the trails again. Watch local riders rip it up in classic fall conditions.